This week, YouTube is celebrating the geek culture and in honor of the occasion, it has planted a few surprises in store for users. While Geek Week is a virtual event where fans can check out original content from some of the best online nerd commentators, the video social network wants to make the whole thing a bit more interactive. 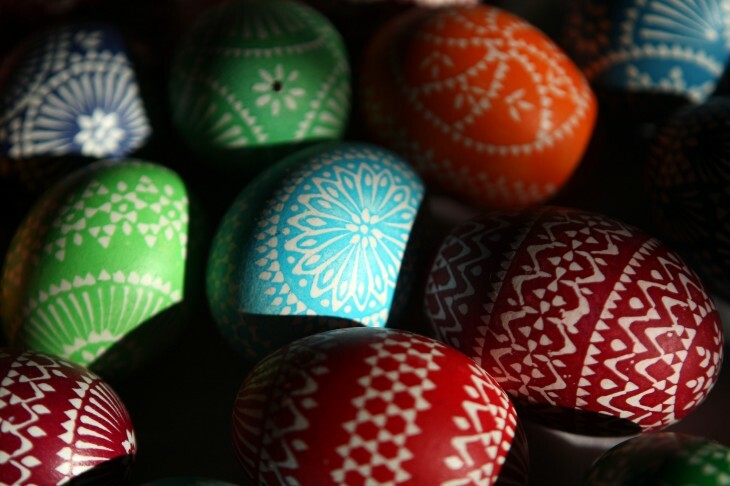 That’s why each day of the week will have at least one Easter Egg that will hopefully get you in the geek mood and engaged. While we’re not aware of all the tricks YouTube is pulling, we do know of some that have already been revealed, including one involving the site’s layout. 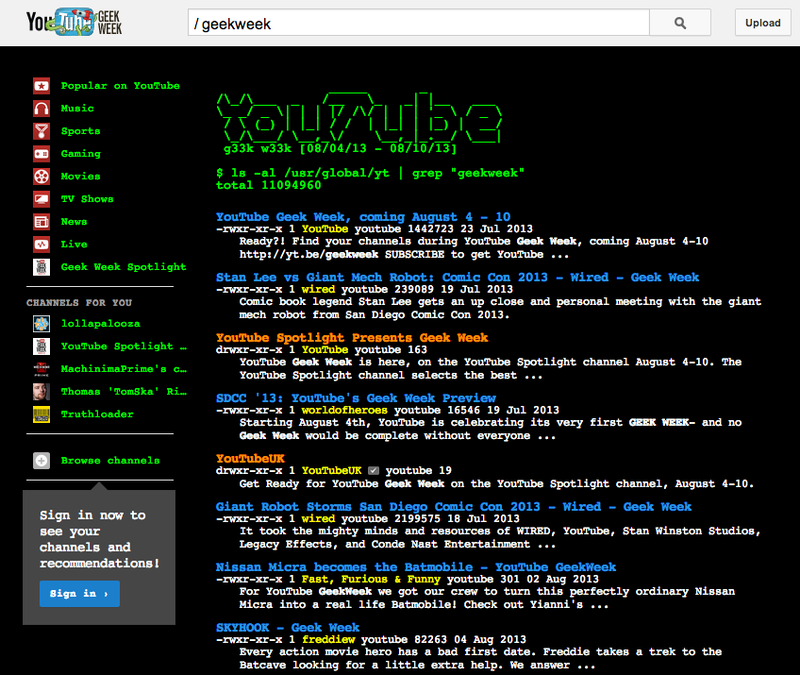 Have you tried doing a search on the social network for “/ GeekWeek”? If you do, you’ll see that the search results page is converted into a fake programming and ASCII layout. To help promote your geek cred, YouTube is offering badges that you can earn just by watching Geek Week videos. The service will be dropping hints on Twitter with the hashtag #GeekWeek. And if you don’t want the badges to be featured anymore, just clear your browser data. One of the most recognizable sayings of the science fiction and geek world, this easter egg will make thumbnails and page elements on the screen float around to simulate them being controlled by “The Force” as the mouse is moved. 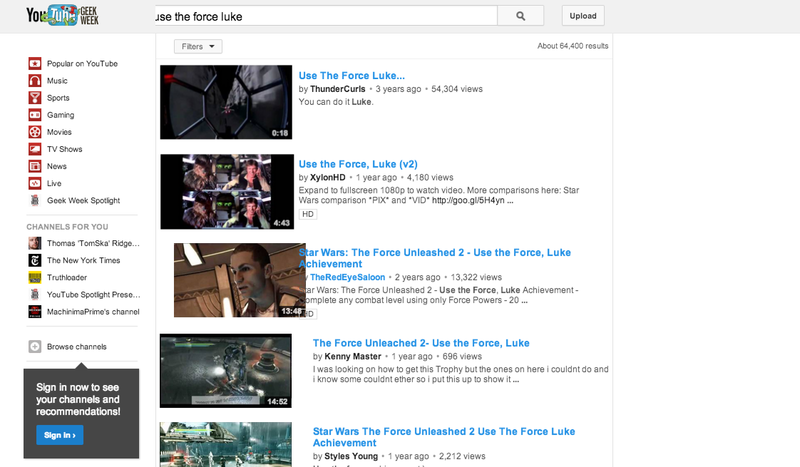 To activate this feature, search for “use the force luke”. Borrowing from one of Star Trek‘s most popular sayings, this will animate the videos in a way so that they appear to materialize onto your screen like it came from a transporter. This one isn’t based on a science-fiction movie or genre. Rather, it’s in honor of “global geekery” and based around Fibonacci numbers — those series of numbers where the sum of the previous two in the order equal the next number (e.g., 0, 1, 1, 2, 3, 5, 8, 13, 21, 34, 55, 89, 144, …). Fans that search for “Fibonacci” on Monday will see the results page appear as a series of tiles showing up one at a time in a Fibonacci tiling. Based on this theme, there are perhaps more easter eggs in store for users throughout Geek Week. Each one will most likely be timed to that day’s topic as the rest of the week will cover science, education, superheroes, gaming, and cooking, cosplay, and even an all-out nerd debate. More than 100 YouTube channels will be highlighted during this seven-day event and will feature original videos, series premiers, creative collaborations, and other popular geek videos found on the social network.